How long to drip acclimate if parameters are very different? If I hypothetically get a cherry shrimp from a local mega pet store chain and their water parameters (pH 7.6+, TDS 600+) are quite a bit different than mine (pH 6.4-6.7 TDS 120), how long do I need to drip acclimate to make sure the shrimp doesn't experience any shock? I set up a new tank and cycled it for about 5 weeks. It was intended to be a new home for my current shrimp + some future Taiwan bees. But just to make sure it was OK, I got a single cherry shrimp from the local pet store to test it out. The day before, I did a 100% water change to get rid of the nitrates from the cycling. The next day evening, I got the shrimp and did 5 hours worth of drip acclimation due to the very different TDS values and then put it in the tank. For the first few hours, it swam around very actively / frantically. Then it calmed down. It would stand in one spot for several seconds, but not eat (or only take two stabs at the substrate), and then zoom off. Day two: shrimp tends to camp in one spot motionless, but saw some stuff in its digestive tract, so it must have eaten when I wasn't looking. Added some Bacter AE, which caused the shrimp to start moving again and eating over the next 12+ hours. Day 3: inactive again (but moves to a new spot every several minutes). In the evening I saw a molt shell, so I assumed it was resting. So I wonder if death 3 days later can from that initial shock, or the more worrying possibility is if there is something else wrong with this new tank. It took a long time to cycle, so there are patches of green algae, brown (diatoms?) and also has some critters that must have come from my old tank like copepods and rhabo(something) worms, both of which are supposed to be harmless. how long do I need to drip acclimate to make sure the shrimp doesn't experience any shock? This is my personal method, and I have not lost a shrimp when adding to a new tank for many years now. With my method of drip acclimation, the answer to your question is ... there is no time limit. Drip acclimation based on the 'time' factor is fraught with inaccuracy. So the answer is ... drip acclimate until the original water (bought from store or anyone else) matches your tank water. How long will that take? As long as it is needed ! 600TDS down to 120TDS could take 24hrs, or 30hrs, or whatever. It doesn't matter as long as it gets down to the same water parameters of your tank. You only need to test TDS, which is easy with a TDS meter. Because by the time the store bought water matches your tank TDS reading, all the other parameters will be the same. It doesn't need to reach exactly 120TDS either, you can stop at 125TDS for example. But closer to your tank parameters, the better. One caution, since the new shrimp will be in a separate bucket or container, you need to make sure it will not fill up and overflow if you leave it unattended overnight. Second caution ... temps. Since the new shrimp will be in a separate bucket potentially for many hours, you need to ensure the water in this bucket is not going to get too cold or to hot. This is particularly troublesome in cold winters or hot summers. Got two (identical) shrimp from a local pet store that had good yelp reviews. However, their water quality was kind of bad: Ammonia 0.25, Nitrite 0, nitrate 30+! pH 8, GH 14, KH 8, TDS 410. Despite this, the shrimp were actively eating at the time I put them in my drip container. I added some Prime. Separate the two shrimp into tubs floating in my main tank. One gets the super slow drip acclimation, the other one somewhat faster. Did a 1 day drip acclimation to my own water which is: temp 74F pH 6.5-6.8, GH 6 KH 0-1, TDS 150 Ammonia / nitrite /nitrate = 0. (This is intended to be a caridina tank with buffered substrate, but I know that neos can do ok in these conditions too) I use RO water + salty shrimp mineralizer. When I first put the shrimp in, and the first 30 hours or so, the shrimp was acting very normal and shrimp-like, e.g. walking around and grazing, eating and pooping a lot. But from the second day onwards, it just tends to stand around stationary in one spot not moving. Sometimes (rarely) it will graze a little bit, but most of the time it is frozen. The other shrimp is in the super-slow acclimation bin (TDS is 220 by now) seems to be slowly eating. Where the guy claims that for KH differences greater than 3 you should transition them over a week or more. That shrimp molted on the second day and was inactive for about half a day afterwards. But now it seems to have resumed activity, so I guess it made it. As opposed to the prior shrimp that only got 5 hours drip acclimation, molted on the second day, and then died. The third shrimp is still in the quarantine tank, with the TDS being lowered a tiny bit each day. If I assume that the molt means it was affected by the water change, then maybe even 1 day acclimation is not long enough if the parameters are very different. 1 day acclimation is not long enough if the parameters are very different. One full day might not be enough, if the parameters are very different. Use your TDS meter as the guide, not the clock. 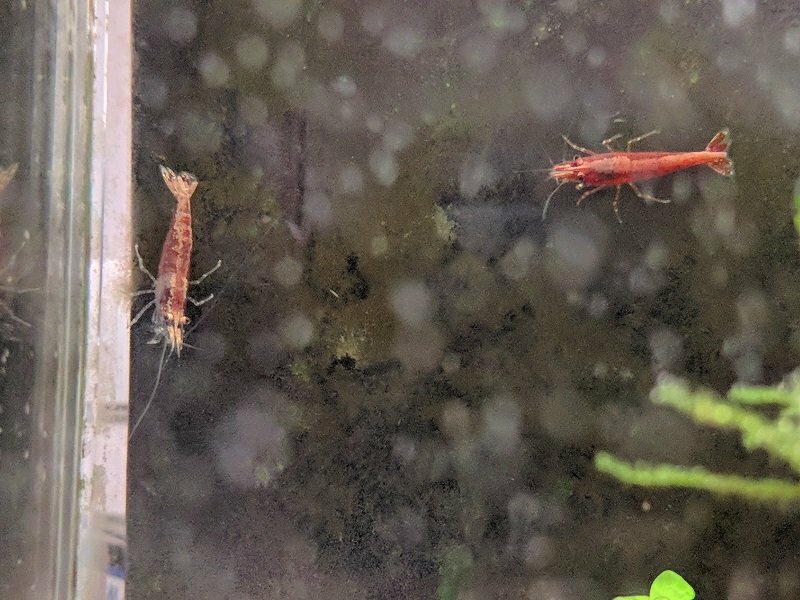 Update / summary: I got two cherry shrimp that look about the same from a local aquarium store with parameters: TDS 410 GH 14 KH 8 pH8. My own water is pH mid 6's, TDS 160, GH6 KH 0-1. I guess the lesson is that even a day might be too fast if the water conditions are very different, and the shrimp can still be "messed up" two weeks later. Here's a picture of the two shrimps next to each other. Update: The "fast acclimation" shrimp was more active and grew faster. What's been happening is that every time it molts, the colors go a bit clear the next few days, but eventually becomes opaque red again a few days later. The amount of "going clear" has been slowly decreasing with each molt, so the colors are becoming "more stable" so to speak. It still has a big pink stripe along its top, though.